Born without a right hand and with no toes on his right (kicking) foot, Dempsey seemed an unlikely football player. Still, he played offensive tackle in high school and defensive end, in addition to placekicking, at California’s Palomar Junior College. Dempsey spent 1967 in the Atlantic Coast Football League with the Lowell Giants where he booted just two field goals but a league-leading 42 extra points and joined San Diego’s taxi squad in ’68, where a special kicking shoe was designed for him that would, in time, generate controversy. While capable of kicking for distance with his size and leg strength, accuracy was a chronic problem. Saints went 5-9 to finish third in the NFL Capitol Division. 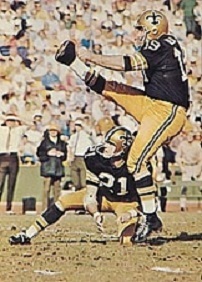 Dempsey gained notoriety during a 1970 season in which he kicked a 63-yard game-winning field goal against Detroit, which exceeded the previous NFL record by seven yards. He hit on 18 of 34 field goal attempts overall, with three of 50 yards or more but with three misses inside the 30 and just one of five good between 30 and 39 yards. Dempsey lost out to Skip Butler in the 1971 preseason but caught on with the Philadelphia Eagles and, active for the last five games, led the NFL in field goal percentage (70.6) while connecting on 12 of 17 three-pointers, including a then-club record 54-yard kick. He spent three more seasons with the Eagles and had a six-field goal game in ’72. His most productive year in Philadelphia was in 1973 when he made good on 24 of 40 field goal attempts (60.0 %) and 34 extra points with no misses. However, with the goal posts moved to the back of the end zone in 1974 Dempsey attempted just 16 field goals, was successful on 10 of them, and missed four of his 30 extra point attempts. He was traded to the Los Angeles Rams in 1975 and, while his field goal percentage rose to 80.8 as he succeeded on 21 of 26 attempts, he continued to struggle with extra points. Dempsey’s performance slipped in ’76, his last with the Rams, and he spent time with the Houston Oilers and Buffalo Bills before his career ended in 1979. Overall in the NFL, he kicked 159 field goals out of 258 attempts (61.6 %) and added 252 extra points, with 30 misses, for a total of 729 points. With the Saints, he was 40 of 75 on field goals (53.3 %) and 49 of 52 on PATs for 169 points. He received his lone Pro Bowl selection with New Orleans, as well as his greatest fame with the 63-yard field goal that remained the NFL record until 2013.